Listen to our RapidFire webinar today! 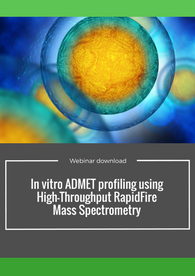 Our Discovery DMPK scientist, Raffaella Ricci, discusses employing High-Throughput RapidFire Mass Spectrometry for in vitro ADMET profiling in this insightful webinar. In the face of advancing technology in combinatorial synthesis and high-throughput screening, the drug discovery process continues to evolve. Drug metabolism and pharmacokinetics (DMPK) studies play a key role in lead identification and optimization, being relevant in understanding the mechanisms of drug absorption and disposition, which have proven invaluable to establish structure-activity relationships that guide new chemical synthesis. This fast-paced development process has imposed an enormous burden on the analytical chemist to design faster and more sensitive assay techniques to aid the drug discovery and development. Several High-throughput assays are designed to investigate the DMPK attributes and Liquid Chromatography-Mass spectrometry (LC-MS/MS) has become the technology of choice for sample analysis for its sensitivity and specificity. In the last ten years the RapidFire system coupled to mass spectrometry has been playing an important role in speeding up the sample analysis by producing run times of 8 s/sample, with reproducibility and data quality comparable to LC-MS/MS methods. The webinar will discuss the features and the potential applications of RapidFire system in DMPK assays along with HighThroughPut screenings. Raffaella Ricci is the reference person for the in vitro techniques applied to Drug Metabolism and Pharmacokinetics group within the drug discovery department at Aptuit, Verona, Italy. She graduated in chemistry and pharmaceutical technology full marks with honours by the University of Rome. After a period as placement student in the chemistry department of Celltech in Cambridge UK, she joined the DMPK group of GlaxoSmithKline R&D Center of Verona Italy, where she developed most of her professional skills.